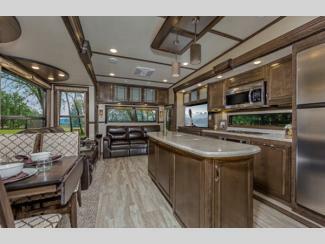 If you’ve been looking for the Grand Design Solitude and Grand Design Solitude S-Class for a great deal, look no further than what we have to offer here at Windish RV. 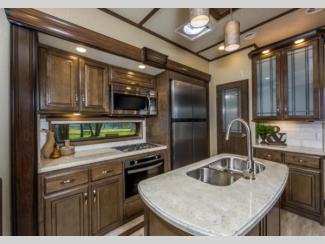 We’re delighted to offer these RVs at a fabulous price during our Grand Design sale. A great kitchen is an important part of an enjoyable RVing experience. One thing that sets the Solitude apart from the competition is its impressive kitchen that promises you everything you need to create delicious meals. Solitude’s bedroom in every Solitude and Solitude S-Class floorpan, offers a spacious place to kick back and relax after a long day of fun with the family. 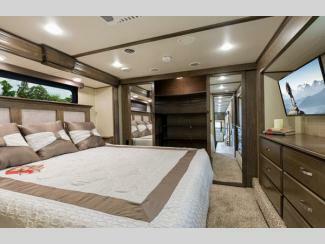 You will love the extensive storage, plush carpeting, and comfortable bed. Every aspect of this bedroom comes together to provide you with everything you need for comfort. The gorgeous living area was designed to bring the entire family together. Centered around the kitchen, this is the perfect space to unwind and relax with the family. You’ll love the large entertainment center, as well as the plush furnishings that make for a great space to make memories. If you’re interested in learning more about our selection of Solitude fifth wheels for sale, contact us. We can answer any questions you have and make sure you have the information needed to make the best decisions for your needs.